Before 1948 there were no gymnasiums in Finnmark, the closest one was in Tromsø, and the result was that few people from Finnmark got any further education that required gymnasium. The gymnasiums that were established during the reconstruction period in Alta, Hammerfest, Vadsø and Kirkenes were regular Norwegian gymnasiums that did not even have Sami language as a subject and had no Sami content. At the end of the 1950’s demands were made for a separate Sami gymnasium that at the very least had Sami as a subject, to some degree Sami content, and was situated in a Sami environment. The response from the authorities was that to start a Sami course at Alta gymnasium would be sufficient. This did not happen. There was made a gymnasium in Karasjok, but was this a Sami gymnasium? Here we have edited out some parts of documents telling this story. 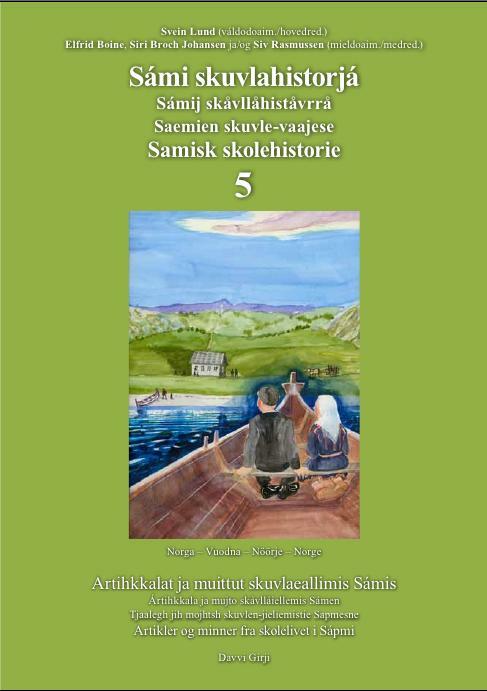 The whole documents can be read (in Norwegian or Sami language) in the book Samisk skolehistorie 2. Why gymnasium for the Sami? 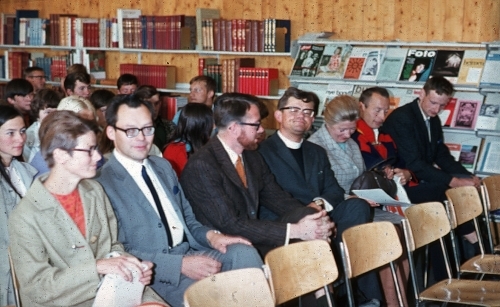 The assistant pastor in Tana at the time, Stein Henriksen, a former teacher at the Sami folk high school, wrote in 1959 a long article about Sami gymnasium printed in both newspapers Nuortanastte and Finnmarken. Up until this day we have in fact just one school that is Sami and that at the same time can give some sort of higher education. I’m referring to The Sami folk high school in Karasjok. What this has meant for the people can’t easily be measured. But the love and sympathy given from Finnmark in the north to Femunden in the south may give a small indication. What is then the reason for its success? 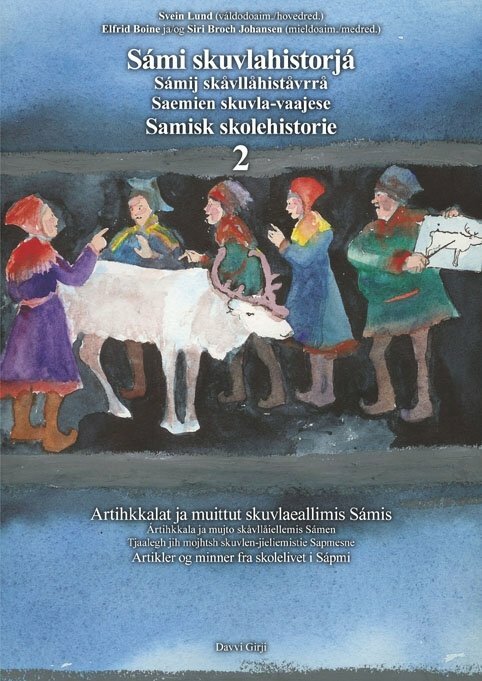 Yes, it is the Sami peoples’ own school, the only one. Here they can be themselves. Here they don’t need to be afraid of being looked down upon and despised. Here it’s equally good to be Sami as it is to be Norwegian. And no less important, here they get education in their own language, and acquire knowledge of their ancestral heritage. Oh no, there is no reason to doubt that the folk high school in Karasjok has fulfilled its promises. 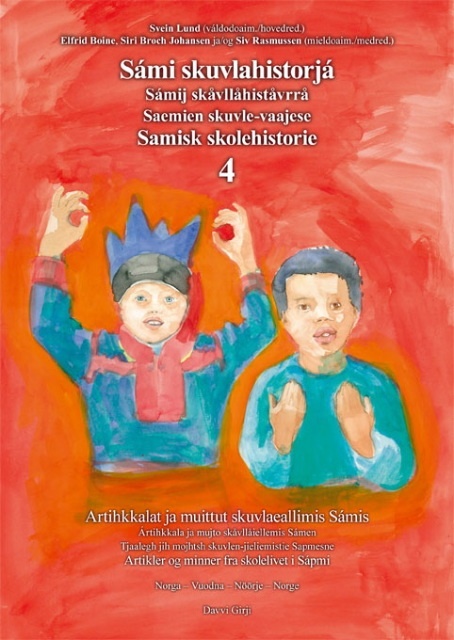 Yet at the same time it has revealed an enormous need, the need for a Sami school system throughout the whole education. Educational institutions where children and youth don’t have to experience the trampling of their parents’ language and culture, or simply see it passed in silence. Where they can be allowed to meet the new on the foundations of the old, and themselves be a part of building up the Samiland of tomorrow. To reach that goal, we must at the very least aim for a school of higher education. The people need leaders. They need skilful men and women who fully master the Norwegian language and belong in the Western European common culture, yet who at the same time through thorough introduction in their mother tongue and heritage, have gained the necessary prerequisites to compare both cultures against each other. Only then can they find a synthesis in pact with today and the future. As it is now, the most gifted part of the youth apply for the Norwegian gymnasiums in Finnmark or further south. What this leads to is obvious: the young will most likely receive a reasonable orientation in what the schools give, being the cultural heritage of the West. But the heritage from their ancestors is pretty much outside consideration. And this happens whilst they must live and breathe daily in a Norwegian environment. Under these conditions it’s no wonder that they against their will or not are assimilated. Think about what would have happened had Norwegian youth had to go to Germany to get their artium [final secondary examination]. If we had lost the war, we would have risked doing such things. I don’t think we would have liked it. 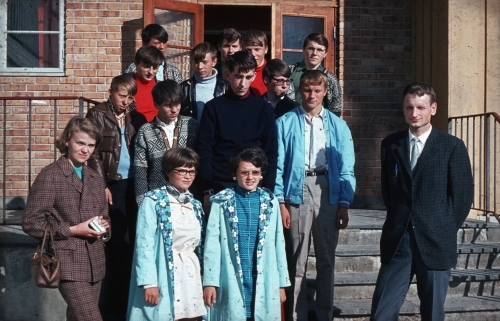 In 1969 the gymnasium classes in Karasjok on could finally open. This is from the opening. 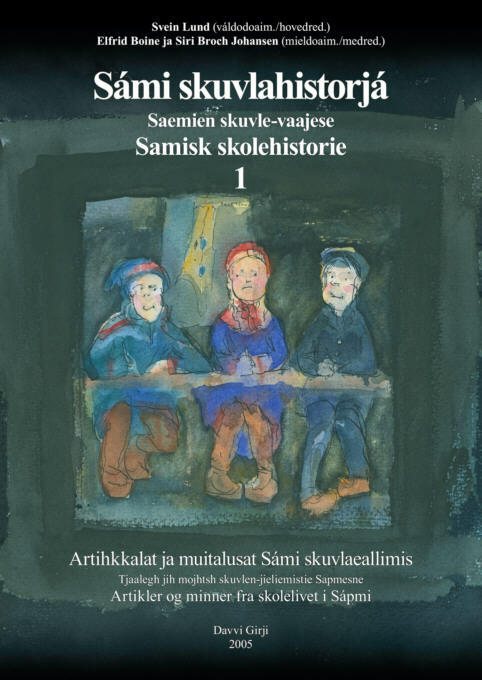 In light of this we turn to the Finnemisjonen (Sami Mission), hoping that there are capabilities to erect a school of higher education for Sami corresponding to the principles set above. In 1967, the 19-year-old Inga Ravna Eira from Karasjok was a pupil at Alta gymnasium. She wrote an essay in Norwegian explaining why she thought there should be a Sami gymnasium. The question which is most discussed these days is the necessity for a Sami gymnasium. Personally I believe that such a gymnasium should be created. What we need are more people with education for the Sami. So far most doctors and teachers have only spoken Norwegian. Many of them have often not understood the Sami and their problems because of the language. It is people with Sami background who are the right ones to help the people of inner Finnmark in solving their problems. As the conditions in the gymnasium are today, Sami youth experience problems with the Norwegian language in particular. In this field they will lose much compared to their fellow pupils. The biggest problem is not being unable to speak, but being unable to write Norwegian. We all know the difficulties of writing Norwegian is in its placement and use of prepositions. I think the linguistic difficulties are one of the main reasons why there are so few youths from inner Finnmark in gymnasiums. For the sake of language it is in my opinion important with a Sami gymnasium where the Sami language, culture and history are emphasised. I’m sure that it would lead to more and more Sami finding their way to the gymnasium. In order to speak another language, I think it is important to know one’s own mother tongue, both the spoken and written forms. The mother tongue lies closest to heart and one has spoken it since one was little. It would in my opinion be much easier for us to learn Norwegian, had we first received the foundation of Sami language. The Country Council proclaims that it will be not build and run a separate Sami gymnasium. The low rate of pupils at the present gymnasiums in the county makes the building of a new gymnasium most concerning. The County Council furthermore thinks that regarding schools it would be better for such a matter resolved by creating a Sami course at one of the existing schools, preferably in Alta. 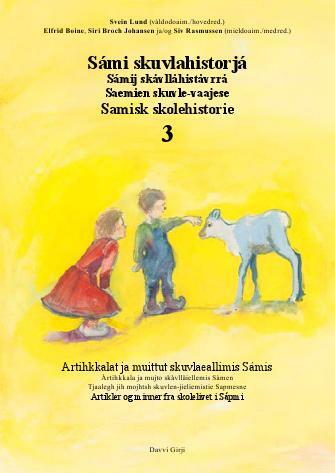 After the decision made by the County Council of Finnmark regarding the launching of a Sami course in the gymnasium in Alta, a petition campaign was made for Sami gymnasium among the teachers who had a higher education in Sami language and culture. From reports in the radio and the press we have gotten the impression that the Ministry of Church and Education considers the placement of a Sami gymnasium in Alta. If this report is correct, we would like to pronounce our strongest disagreement. On the basis of our knowledge of questions regarding Sami schools, acquired through special education and in part through several years of involvement in these matters, we would strongly advise against the planned situation of a gymnasium with a Sami course in Alta. If the main purpose for a gymnasium for Sami youth should be attained, it should in our opinion be situated in a Sami environment where the Sami are a majority and characterise the life within the community. We doubt that Sami youths will apply for the Sami course at the gymnasium in Alta, and we assume that it will be hard to find teachers of Sami subjects to Alta. We, having had special education in Sami language and cultural knowledge, do not intend to apply for teaching positions in Alta. We support the demand from the Sami organisations about stationing a gymnasium with a Sami course in Karasjok. Signed by 28 names. At the time there were 29 people in Norway who had a formal education in Sami language. 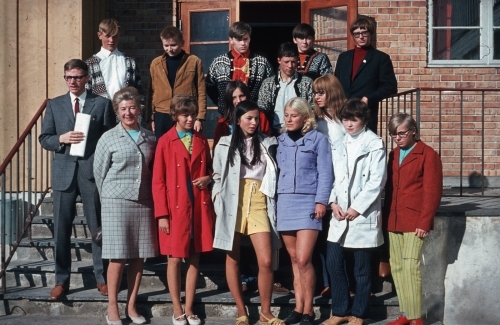 The first classes who began at the gymnasium in Karasjok in 1969. The linguistic courses had a majority of girls, whilst the majority in the science courses was boys.